« Is Curtiss Street named after Curtiss-Wright Airplanes? 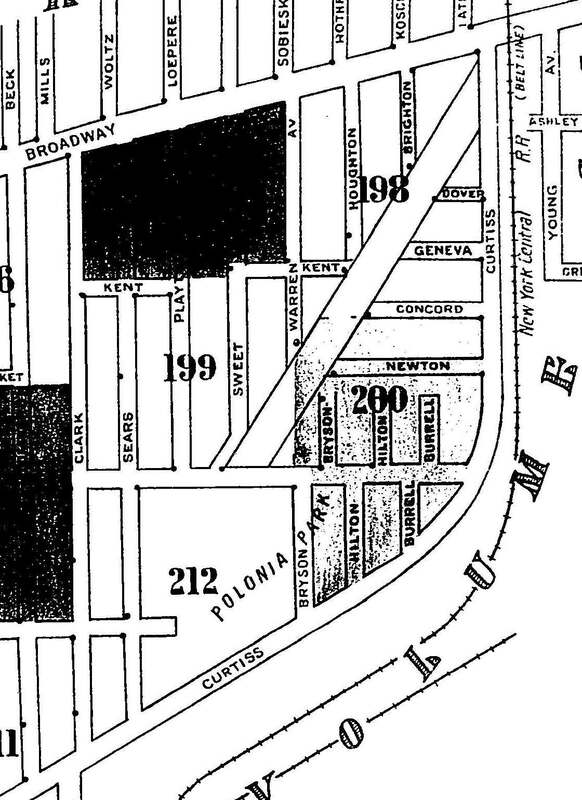 While researching Curtiss Street, I noticed that there was Polonia Park marked on some of the maps. I have a great interest in the Broadway-Fillmore neighborhood and the area around the Central Terminal in particular, and I had never heard of this before. I got sidetracked from my street researching and ended up finding out some interesting stuff which I would like to share with you all. I know it’s not a street history, but hopefully you all will enjoy these tidbits of information as much as I do. Polonia Park was located on Curtiss Street prior to the Central Terminal’s construction. The park was purchased by the City in 1913 at the same time as the land for Schiller Park, Willert Park, an extension to Riverside Park and an addition to Lanigan Park. The article did not elaborate on this, but my guess is that because the land had been part of the railroad corridor, it was ill-suited for parkland. Railroads use a great deal of pesticides to keep foliage from blocking the tracks, as can be seen when abandoned railroad corridors are still free from most grasses and shrubs long after the trains stopped coming through. The West Shore Railroad, which connected Buffalo to New York City formerly cut through this park, following approximately the path which Memorial Drive follows today. Despite the reports that the land was not useful as a park, the park was used during the early 1920s, as there are reports in the newspapers of baseball scores for games played in Polonia Park. By March of 1925, the property was owned by the Buffalo Board of Education as the intended site of the Peckham Vocational School. Peckham Vocational was located at the corner of Peckham and Townsend, however they originally started out in the Adam Mickiewicz Library on Fillmore while the original school was being constructed. 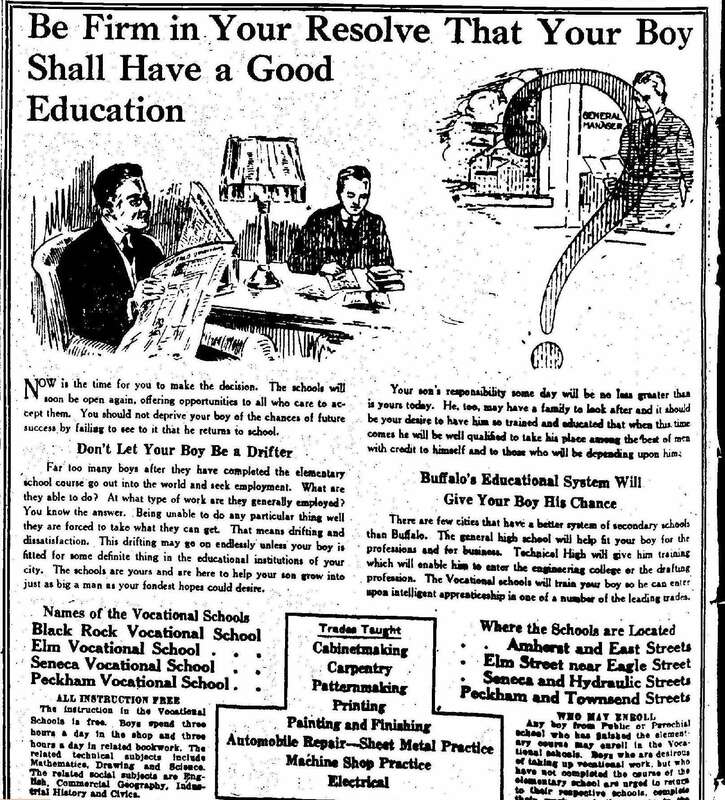 As this ad from the Buffalo Morning Express, August 29, 1922 shows, there were four vocational schools in Buffalo at the time. This was the time when many students would go out in the world to work after they completed 8th grade. Vocational schools were a way to continue your education, while also learning a useful trade. Peckham Vocational was a source of pride for Buffalo’s polish community. The residents of Polonia were concerned that the high schools located in Buffalo were overlooking their community, so the residents rallied successfully to open a school in their neighborhood. Peckham Vocational opened in 1911. Board of Education had plans to build a new school and was about to let the contract to build when the railroad approached them to purchase the property to build what at the time was being called the “Fillmore Station”. In exchange for the Polonia Park property, the Board fo Education received the property at the corner of Sycamore Street and Koons Avenue. Peckham Vocational School was renamed Emerson Vocational School in 1937, after the school’s superintendent. The school operated at its Sycamore Street address for 62 years until 1999. Since then, the building has been remodeled and renamed Harvey Austin Public School 97, and operates as an elementary school. After I posted my post on Curtiss Street, Marty from Forgotten Buffalowas kind enough to share these pictures of another planned park in Polonia. It was clear that the people who lived in this neighborhood wanted a park, since they used the land that the chamber of commerce called unsuitable for a park as a park, and then plans were development for this park around 1938. For reference, this map north is towards the bottom. This land is currently the residential neighborhood between the Central Terminal and Broadway. Sadly, this park was never built. While the residents of Polonia had successfully rallied to get a school built in their neighborhood in 1911, it seems that they were unable to rally enough support to build a neighborhood park. Perhaps because it would have involved tearing down houses? Recent efforts have occurred at the Central Terminal to build an urban habitat in the vicinity of the former Polonia Park. The Urban Habitat Restoration project is working to reclaim the land which was used as a parking lot during the height of the Central Terminal’s use as a train station. This project is working to restore some of the landscape, using native plants and green sustainable methods. For more on this project, check out the Central Terminal Website here. Over the course of the past 100 years, this piece of property has transformed from railroad corridor, to park, planned use as school, to use as a parking lot, and now is being restored back to natural landscape. Not too shabby of a history for our little piece of land that was once known as Polonia Park. Learn about the history of other streets in Buffalo by checking out the Street Index. Buffalo Live Wire, Vol. VII, No. 6, June 1916, published by the Buffalo Chamber of Commerce. 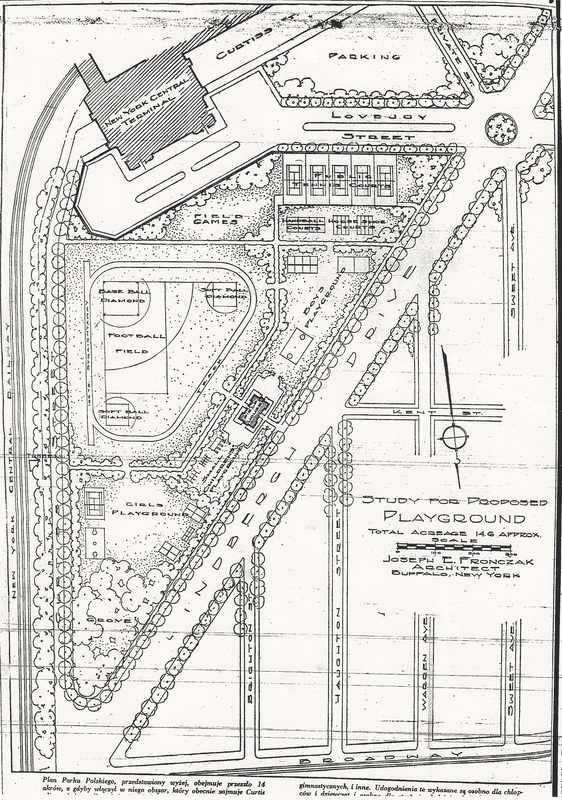 Plans for park designed by Joseph Fronczak provided by Marty Biniasz. Excellent follow up to the Curtiss Street post!